Darren you demonstrated pure integrity while you and your crew was constructing our stone wall on the hottest day of the year. It turned out awesome and you will be receiving calls from my neighbors for more work. It really made an impression with my wife and I along, with my neighbors. Thanks again. We have owned our current home for 18 years now. In that time, we have contracted with at least 10 different "landscapers" to do a variety of projects, some big and some small, who profess to offer quality and timely service. 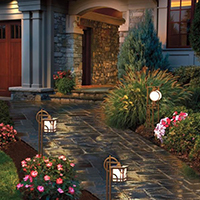 We have been disappointed at every turn, except when we signed on with Personalized Lawn Care LLC Landscape Contractors. Personalized Lawn Care is a unique company. From the top management personnel to the laborers, they were a pleasure to deal with. They showed up when they committed to do so, they were knowledgeable about our project (which was very large), they had great suggestions for changes as we went along, they listened to out suggestions, they were neat and clean, and they completed their work on time. The company has developed a "culture" which seems to pervade the whole organization. 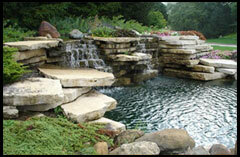 They are different from any other landscape contractors we have employed. Usually we go into our home improvement projects with fear and trepidation but we can unequivocally state that Personalized Lawn Care alleviated our fears early on and it only got better from there. We would recommend Personalized Lawn Care Landscape Contractors to anyone who wants a quality job done in a timely fashion, with the level of care and concern for your project that you expect. Just wanted to drop you a belated note to let you know that the replacement birch tree looks great; and to express my appreciation for the responsive customer service you and your team provide. Our property in Kirkwood has never looked better. Your crews are professional, hard working, and show great pride in their work. I would like to express my appreciation to Darren and his staff for the outstanding job you did with the work you performed at my home. Excellent, excellent job. Many thanks for the tremendous job, the attention to detail and the commitment to only the highest of integrity. Thank you so much for a great job on our lawn care and clean-up, our home looks amazing. Darren, you and your crew were very professional. It was very kind to come out on short notice and making our home a show place for our party. Thank you, for an outstanding job - well done. Bob and I would like to thank you for a professional landscaping job you did for us. It is just the way we pictured it looking. Thanks again for all you have done and we will enjoy sitting in our back yard, enjoying the beautiful landscaping. The site has come together so nicely! The grading looks great, and once the plant material starts to grow leaves and flower, I can't imagine how nice it will look. Your guys just left here a little while ago. In one word, they were OUTSTANDING. They worked very hard and did a great job. Please thank the three of them for the super work. I'm calling to tell you how pleased I am with you for taking care of the fallen limb. You guys are awesome! Thank you, for such a beautiful job. Your crew works so very hard. I think the world of you and appreciate all your efforts. The house looks beautiful. What a pleasure it was to arrive home yesterday to see the wonderful job you did with the mulch and edging in my yard!! It looks great and I'm sure all of my neighbors are envious. I have always been and continue to be pleased with the quality and professional nature with which you deliver your services. Thank you so much for the terrific work! I want to let you know what a hard working, dedicated and knowledgeable staff you have at Personalized Lawn Care Landscape Contractors. From our first meeting, through spring cleanup and each weekly visit, it is evident that we have professionals taking care of our landscaping needs. Even our employees have noticed and commented on how thorough the landscape crew is. It is a pleasure working with you and your managers and observing what I had thought was the lost art of good landscaping. My lawn has never looked better, thanks to you Darren! I returned home last night and was very pleased to see the work you did. The property looks so much better. The boys were here yesterday to remove the leaves and they did a great job! The yard looks beautiful. Just a line to let you know how pleased we are with your staff and services. The crew did a great job, finally we have someone good. Thank you for your service this summer and in the past. Your employees were always quick and thorough, leaving us with a beautiful manicured lawn. Hats off to the crew that cuts my lawn! I am very pleased that they are remembering to raise the deck on the mowers, when cutting my lawn. A little effort goes a long way in making a lawn look spectacular and making the customer happy. On behalf of the Board of Directors of our Condominium Association we wish to thank you for your efforts in snow/winter condition management during this past season. We all realize how exceptionally difficult it was to keep up with the continual snow and icy conditions.